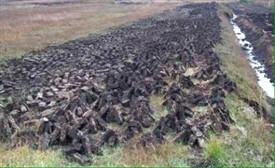 In the old days almost every farmer had a bank of turf, to work on in spring. The turf cutter’s work was strenuous. With every sinew stretched he cut the individual sod with his slean (see image) and threw it onto the bank in a random fashion until he had the required amount cut. When turf cutting, it was very important for the turf cutter to ‘keep a straight face’ that is, to keep a straight face on the bank being worked. A week later depending on weather the turf was footed. Once the turf was dry and seasoned it was brought home by horse and cart and made into a reek in the garden. It was covered with a water-resistant roof of thatch. This page was added by Averil Staunton on 04/12/2011. 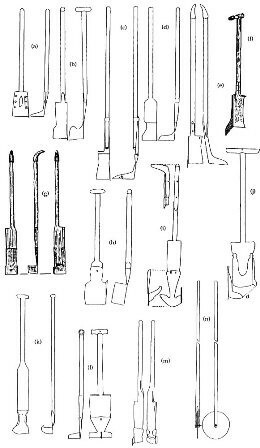 Sketches of turf cutters O, P and Q are missing.